How about a gala outing with friends and family onboard a spacious tempo traveler in Vizag! Every automotive innovation boasts of certain classic features dedicated to the comfort and convenience of the traveler. The Tempo traveler manifests the essence of low cost utilitarian vehicle catering to mass transportation. Harnessing the service of such a vehicle we believe in delivering value to our customers. 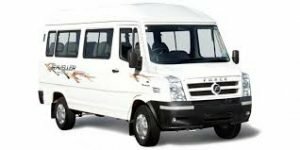 The cost effective response of this luxurious source of conveyance offers us an added advantage to offer you rides at incredibly reasonable prices. Be it a travel across the city, an outstation trip or a picnic with the closest buddies, a tempo traveler provides ample space for a minimum of 10 heads. The make, look, feel and accommodating capacity, majorly contributes to its immense popularity. Join us onboard to feel the difference!